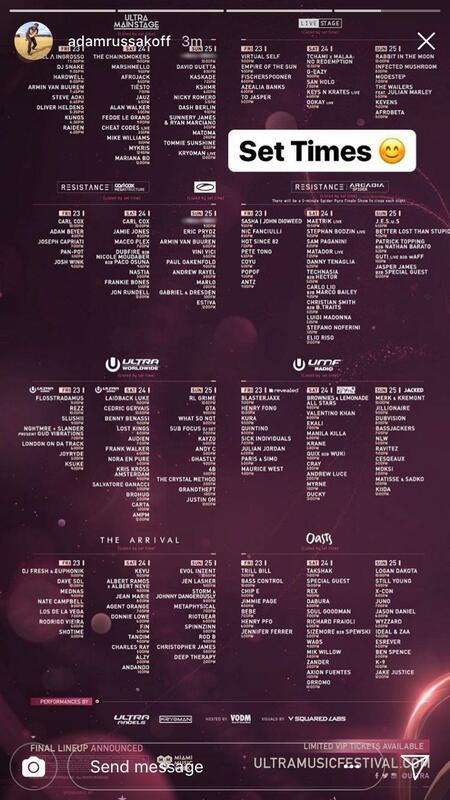 Ultra Music Festival is just over a week away and excitement has been ramped up even further as the set times for the enormous Miami festival have been unveiled. In terms of headliners, the mainstage will be closed by former Swedish House Mafia members Axwell & Ingrosso on Friday 23rd March while Porter Robinson’s Virtual Self closes the Live Stage. The Chainsmokers will headline the mainstage on Saturday while the stage will be closed out on Sunday night by an as yet unnamed special guest. The RESISTANCE side of the festival is looking monumental. On Carl Cox’s Megastructure, the man himself will be closing out proceedings on Friday and Saturday though a mystery guest will finish things up on Sunday. On the incredible Arcadia stage, Sasha & John Digweed will headline on Friday, Maetrik (Live) on Saturday and the inimitable J.E.S.u.S (Jackmaster + Eats Everything + Skream + Seth Troxler) on Sunday. As with any festival this size there’s going to be a lot of clashes to wade through and wrestle with. Take a look at the full list of set times below courtesy of Instagram user Adamrussakof and start planning your weekend. Just the other day, A State of Trance announced its line-up for the RESISTANCE stage. The likes of Eric Prydz, Paul Oakenfold and Vin Vici will join the trance don Armin van Buuren and an unnamed headliner on Sunday 25th March. Ultra Music Festival runs next week as part of Miami Music Week. For more info visit its website.